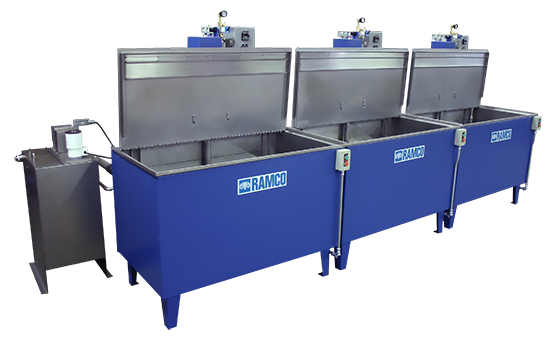 Migi-Kleen is an immersion parts washers designed for the removal of oils, chips and dirt from a wide range of components. It accomplishes this using a simple and rugged pneumatically powered reciprocating platform. The immersion chamber is engineered to adapt a variety of auxiliary items, as required by the application, to heighten the chemical and/or mechanical activity of the cleaning solution. Specifications are available. Please request Catalog 100. Removal of oil and chips from machined components, castings and housings. Removal of buffing and lapping compounds. Cleaning prior to welding, deburring, brazing, or blasting. Precision cleaning prior to assembly or final packaging. General washing for maintenance, rework and/or remanufacturing. Carbon, rust, ink and paint removal. FPI – preclean, FPI process, and post clean. Migi-Kleen does the dirty work. It completely eliminates the need to clean parts by hand. The transport elevator automatically processes the work. Valuable labor is saved for more cost effective operations. Migi-Kleens take up a minimum of floor space and accommodate a wide assortment of component sizes and configurations. A broad spectrum of cleanliness levels can be satisfied. Starting with the basic modular system, you can integrate additional agitation apparatus and/or effluent controls to meet your requirements. From in process to final precision cleaning, the Migi-Kleen Series does it all. Heavy gauge steel (stainless steel) construction with flange up solution drip lip. Sturdy transport elevator with no internal bearings. Hinged cover with fusible safety link. Safety guard to enclose moving parts. Air line filter, regulator, and lubricator. 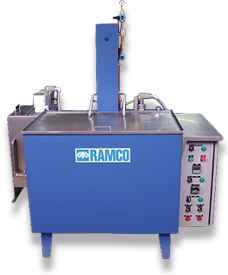 Oil removal systems for tramp oil that rises to the surface. Electric, steam or gas heating systems to provides rapid heat-up and controlled solution temperatures up to 250 degrees F.
Digital timers to precisely controls overall cleaning cycles. Standard reciprocating platform provides vigorous mechanical agitation up to 240 strokes per minute. Dual stroke control — rapidly reciprocating short stroke for general cleaning or long stroke, in and out of solution, for flushing blind holes. 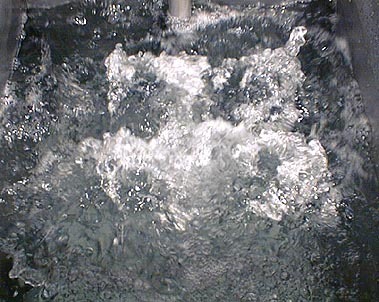 Powerful Filter/Turbo systems (see photo below) to enhance and accelerate the washing or rinsing process. Due to their unique modular design, these units can be combined to readily suit any need. As an example they can be placed side by side to form a wide variety of multi-stage systems with a broad spectrum of cleaning options such as wash/rinse/dry, or pre-wash/wash/rinse/rinse/dry.